Sydney Johansson planned on having her senior portraits photographed outside last week. But when a storm rolled in to Fountain, Colorado, her photoshoot went awry. 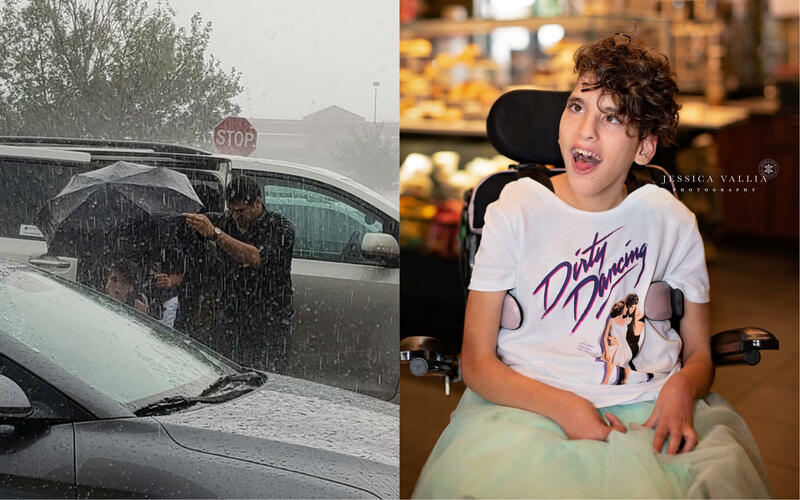 A Starbucks employee who helped Sydney and her photographer continue the shoot indoors is now being hailed online as a hero, CBS Colorado Springs affiliate KKTV reports. Sydney, her mom and her photographer, Jessica Vallia, were at a loss of where to go when rain started pouring on the day of Sydney's senior portrait shoot. Sydney, who has cerebral palsy, is preparing for an upcoming surgery and couldn't reschedule the shoot. They looked for other places to go, and found themselves in a nearby Starbucks parking lot. They were desperate to continue the shoot and hoped they'd be allowed to take photos inside the coffee chain. Not only were they allowed take photos, but a Starbucks employee went above and beyond to welcome them. The Starbucks' supervisor offered the trio and umbrella, Vallia wrote on Facebook. Then,"he came outside in the pouring rain to help us get Sydney inside! He isn't even under the umbrella and trust me, he was soaked through but brought me a dry towel for Sydney," Vallia wrote, sharing a photo from the rainy day. Once they were inside, the Starbucks employee, identified only by Chris, gave them free drinks and let them stay to finish taking photos. Other employees also joined in to help. "Ten minutes later, they came back with all these signs and started hanging them up in the corner and moving stuff so we could shoot there. And I'm like, 'Oh my gosh.' That's when the tears were like, 'Okay we can't cry right now, we'll cry about it later,'" Vallia said. "You don't expect people to do nice things like that, and it just happened," Sydney's mother, Laura Johansson, told KKTV. "I just wanted her to have the average senior session, like any other girl and instead she got THE RED CARPET in a way I couldn't have been more proud to be a part of!!!" Vallia wrote on Facebook. Vallia told KKTV the post has been shared at least 170,000 times and has thousands of likes and shared. "I just can't even keep up with it," Vallia said. Starbucks may not have been Sydney's first choice for senior portraits, but the coffee shop sure helped her "a latte." "All of these fates aligned and gave me the most perfect story for my most perfect kid and I couldn't ask for anything better," Laura said.